"A yummy invention I made up from my pantry and freezer supplies. No defrosting or precooking just cheesy gooey crunchiness. Yummy!" Preheat the oven to 375 degrees F (190 degrees C). Prepare a 9x13-inch casserole dish with cooking spray. Mix cream of chicken soup, Greek-style yogurt, milk, dry onion dip mix, parsley, garlic powder, black pepper, salt, and cayenne pepper in a bowl. Layer 1 bag potato nuggets into the bottom of the prepared casserole dish; top with broccoli. Pour the chicken soup mixture evenly over the broccoli. Sprinkle Cheddar cheese over the mixture; top with remaining bag potato nuggets. Bake in preheated oven until hot all the way through, about 1 hour. I substituted waffle cut fries for the top layer and followed everything else. Really good! It was a hit! Easy! Very good! A little salty but the whole family loved it! 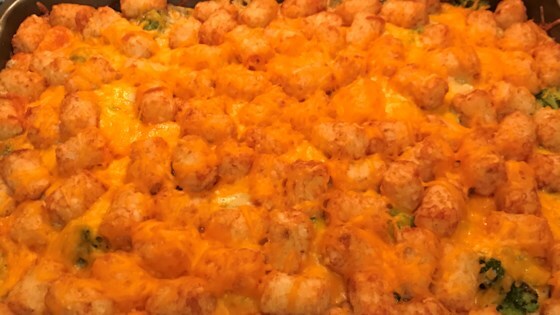 I would make this again although I would cut the tater tots in half and add more veggies.